Felix from Gurney's talks you through the process of planting a rhubarb crown in your home garden. 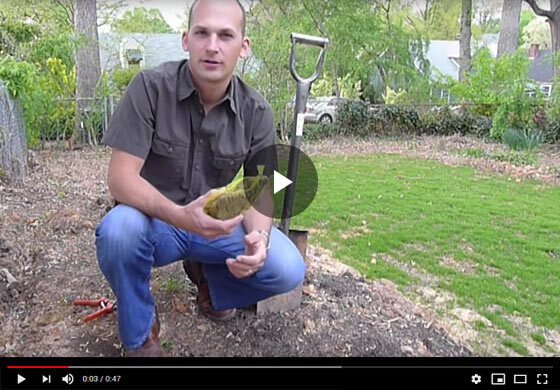 You'll learn the basics of crown anatomy and glean helpful tips on planting and aftercare. Hi everyone, Felix here with Gurney's and today I'm covering some basics about rhubarb, and I have a crown here in my hand, this is what you're going to be getting in the mail. This is happens to be some crimson red. It comes in a mesh bag like this and it really is a nice dormant crown. If you pop that out, there's some pieces that might come off, some pieces of root that were part of the division. If you look here, there's a flat surface to the crown. This is actually where they divided a larger crown out in the field in the production nursery and you can see here, If you look closely, you can actually see that's the, that's the old crown where all the, the new leaves are going to initiate from here. All this tissue right here is where your initiation is going to be this season. There's also another one here, you see, kind of there are two primary crowns tips and there are nodes all along here where you're going to get growth initiations this season. And the rest of the mass is really just roots, storage roots and roots are going to form after that and also along here at the base of that crown. So this is what you're going to get in the mail. It's important to, to note where these crowns are located, coz you wanna orient them upwards in the planting hole. So that's really something point to spot. You don't want, you want all this tissue here to be nice and firm. You don't want it to be a squishy. If it is there's a problem, it's already started to rot and that's an issue. You want it to be nice and firm so make sure and check that when you receive your rhubarb plants. Okay, so we're going to dig a hole and basically what rhubarb likes is really rich organic matter, nice, rich soil so if your soil is a little weak in that regard, doesn't have a lot of dark coloration to it, you wanna add some compost, so I have that already on the side and then really the orientation of the crown below the soil line. You want it about three to four inches, so you need to dig your hole deep enough to accommodate the depth here and then allow three or four more inches above this crown where your soil line is, your normal soil line. So that's what we're gonna do here. I'll dig a hole and we'll show you that. Okay, so I've dug the planting hole, got the depth correct and therefore to allow for the crown as we talked about earlier. I also want to point out here if you look at this crown, there's a little bit of surface mold on some of these here and that's going to get neutralized from the soil. There's plenty of fat in the soil and this crown is nice and firm and so that's not gonna to be an issue. If you see a little bit of that as long as this crown area's firm, it's a non-issue. So we're gonna go and put this in the soil, and I've got my hole dug here and if you'll see that's about the soil level, so we've got about three to four inches, you know below the soil line, that we're positioning, this crown in the hole. And then the other thing is to add lots of nice, rich, good compost. Rhubarb really likes high organic matter and lots of good fertility to the soil and so we're add, add and cover it up. Really easy and then give it a nice thorough watering, And that's all there is to it and then during the growing Season, of course, you wanna keep the weeds free from around your rhubarb and it'll get established the first year and you can harvest a little bit the next spring. Thanks very much for joining us here at Gurney's and have fun with rhubarb. It makes a great pie with some strawberries.